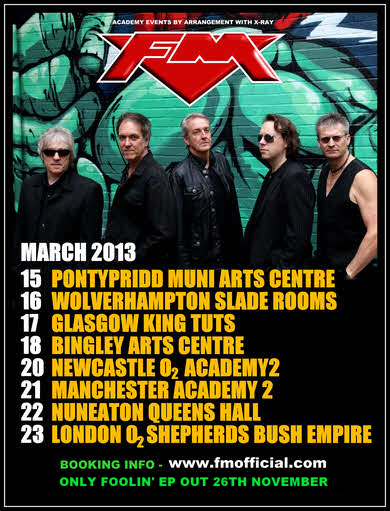 In anticipation of the new album ‘Rockville’ in March 2013, comes this nice little (or should that be long!) 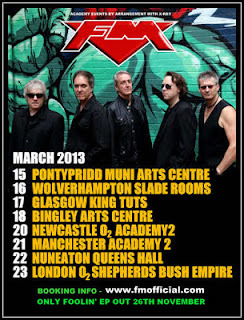 EP to whet the appetite of what’s to come from the best AOR band that Britain has EVER produced. I’ve harped on about how they should be huge (they still deserve to), but the fact that they never broke the US when they had a set of songs in ‘Indiscreet’ and ‘Tough it Out’ that were as good as anything that the Americans (Journey), and Anglo-Americans (Foreigner) had to offer. But the US’ loss is our gain. FM are in the most prolific form of their career and are playing as good (probably even better) than they ever had. This years 25th Indiscreet Tour was testament to this fact. At over 48 mins in length its longer than the debut 25 yrs ago. I remember when an EP was 4 songs on a 7’’ or 12” single! So hats off to the lads for giving their fans VFM! 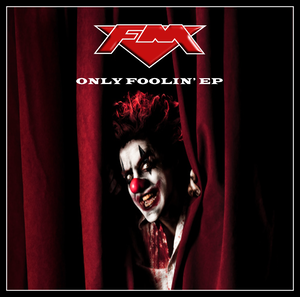 We get 2 new songs, the title track ‘Only Foolin’’, which is an FM across the ages, bringing in ‘Aphrodisiac’ era FM (complete with horns!) with the current polished and grittier edge that Kirkpatrick brings to the party. Its modern era FM at their very best, with ‘no filler’ intention, just a great song, catchy chorus and upbeat tone! ‘Rainbows End’ has 80s US radio hit written all over it. I give this the biggest complement I can, by stating that it’s a song that Rick Springfield would have loved in his prime. (He still is!). The other song is a new? / old song to FM fans depending on your past knowledge of Steve Overland. I suspect a fair few know that ‘A Shot In The Dark’ was a song to come out of the Wildlife sessions a few years back. It’s still credited to Ozzy/Soussan, but Mr O gives it his distinct style and finesse which makes it a very different proposition from the original, and more than gives the Ozzy version a run for its money. OK! Its better! There’s a host of live songs taken from this year’s gig at Shepherds Bush where FM were on fire (you should have recorded Manchester!!) ‘Let Love Be The Leader’, ‘Don’t Stop’, ‘Does It Feel Like Love’, ‘Tough It Out’, and FM’s classic take of ‘Hot Legs’ and old fan favourite. FM have never sounded better live. Finally we have an 8 min extended version (just like the old days of 12” mixes) of Only Foolin’. It’s a nice take on the original, with DJ Jupp I suspect being let loose. Visit pledge music - http://www.pledgemusic.com and give the guys your support. You know it makes sense.